Tile continues to grow in popularity as a floor covering because it is durable, attractive, and easy to care for. It comes in numerous sizes, textures, and colors, offering limitless design patterns. And while tile can be cold and hard on your feet, a non-slip rug can make it more comfortable. 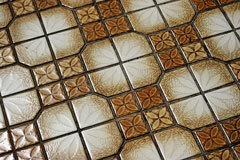 Floor tile is usually 1/2" to 3/4" thick and is manufactured in squares measuring 4" x 4" up to 24" x 24". Tile comes in different types, and you need to be sure to pick the right kind for your needs. For example, some tiles are rated for outdoor use while others are only suitable for indoors. For entryways, you need an abrasion-resistant tile, while for bathrooms you need a slip-resistant tile. Most do-it-yourselfers can install floor tile, or you can have the job done professionally. A ceramic tiled floor needs a flat and rigid subfloor, so you will usually need to remove all the original flooring material and lay down cement backer board. Once the subfloor is ready, you comb out adhesive or pour a bed of mortar and set the tiles in it. It is good practice to blend the tiles from several boxes to avoid any shade shifts from lot to lot. Tiles usually require some cutting to fit, and it will be easiest if you can buy or rent a power tile cutter. However, if your job is small, you can probably use a hand tile cutter. After all the tiles have been cut and set, the final step is to grout the joints. Check the Floors Transformed web site for more instructions on installing ceramic tile floors. Floor tile is relatively easy to clean, but cleaning tips are available to help you keep your floor looking its best. Usually, you just need to sweep away or vacuum debris and scrape off any thick substances. Then, you damp-mop with a pH-neutral cleaner that contains no abrasives. You can use nylon scrubbing pads to remove stains. Your ceramic tile floor is very durable, but the tiles can crack or stain. 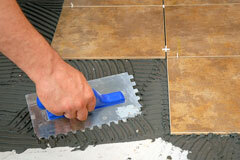 Check here for instructions on replacing a damaged ceramic tile.